Can be sown up to early June. Early sowings (March-April) should be made under glass and seedlings potted on into good sized pots (1 to 2 litre depending on how long they need to be kept potted) as they should not be planted outside until all danger of frost is over. Excellent and very productive variety. The best of all the yellow courgettes we trialled in 2016. Requested for its ability to climb rather than sprawl. But it does need a helping hand with tying in. Dark green fruit. Golden skinned with white flesh. Looks pretty mixed with green varieties. Tried this summer in our attempt to find a really dark skinned courgette. 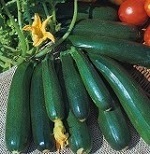 Not as dark as we would have liked but it still produced beautiful tasting courgettes throughout the summer. Bushy plant. Ribbed Italian type with good nutty flavour. Excellent in our trials. Very productive with deliciously tasty, striped fruit. Also known as De Nice a Fruits Rond. Round pale green, ideal for stuffing. 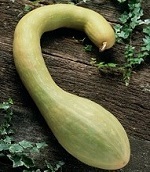 Long, curved, bell ended fruit that can grow to 1m long but best at 30cm (1ft). Vigorous, trailing or climbing habit! Dark green fruit produced over a long period.